Outlook may be the most popular email client on the planet, but it probably doesn't have every feature you need. It could use help in a lot of respects, such as integrating with social networking services, killing spam, and cutting through email overload. The good news: Downloadable add-ons can help you do all that and more. 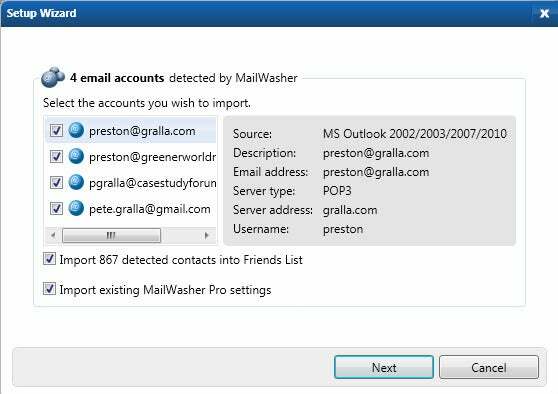 Here are a dozen downloads--many of them free--that can transform Outlook from just another email client into a communications powerhouse. For many people, when it comes to electronic communications, social networking services such as Facebook and Twitter have matched--or surpassed--email in importance. The following three downloads help you get the best of both worlds, allowing you to access social networking services from within Outlook. The Microsoft Outlook Social Connector (free) puts you directly in touch with Facebook and LinkedIn, right inside Outlook. Install it, and a new pane appears below the messaging window when you're reading a message, showing you the latest updates from that contact on Facebook and LinkedIn. That way, you don't have to visit either site to see what's new with him or her. The Connector also shows all of your Outlook communications (including meetings) with the person. Similar to Microsoft's offering, the free Xobni integrates with Facebook and LinkedIn so that you can see updates from your friends within Outlook--but it does the Connector one better by including Twitter integration, as well. What's nice about the feature is that you see tweets only when you're in contact with the person via Outlook, so you aren't inundated with irrelevant tweets. That's just the start of what Xobni can do, though: It also checks Hoover's business database for background information about email senders, and it helps organize all of your email, so you can easily see all the communications between you and your contacts (including message threads, meetings, and files exchanged) in a simple list. It even offers statistical analysis of your email use. If you need more control over tweets within Outlook, TwInbox (free beta) could be the tool for you. This Outlook add-on for Twitter users lets you post tweets, read tweets, and manage multiple Twitter accounts within Outlook. You can even group tweets by topic, search Twitter by keyword, and view graphs that detail your Twitter use. It works alongside other add-ons, including Xobni and Microsoft Outlook Social Connector. Spam is an unfortunate fact of email life. If Outlook isn't doing a good enough job killing spam for you, turn to the following two downloads. If you want, you can even use them together, since they work in different ways. This very useful spam fighter ($29) works within Outlook, hunting for junk mail and then routing it to a spam folder so that it never reaches your inbox. If spam does get in, you can tell Spamfighter Pro never to let the sender's messages through again. You can also block by domain, and the utility provides plenty of spam statistics. 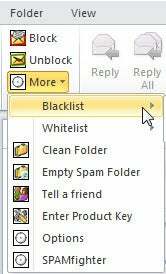 Instead of integrating with Outlook, this free spam killer checks messages before they arrive in Outlook, and it zaps any spam it finds. MailWasher Free also does double duty as a quick-and-dirty email client, letting you preview email there so that you don't have to launch Outlook just to read the messages. For many people, the biggest problem with email is the sheer volume of it. You can easily wind up buried in email overload, unable to dig yourself out. The following two downloads offer some help. Xiant Filer ($20; 30-day free trial) first analyzes how you file email. Then, based on your actions, it recommends the folders into which you should store your messages. The program learns as you use it, and as a result its recommendations improve over time. Once it has done its homework, you'll be able to send email to the appropriate folder instantly, with a single click. Single Click Filing ($10) also files your mail for you, but it takes a different tack than Xiant Filer does. You simply put shortcuts to Outlook folders in a toolbar across the top of Outlook. Then, you can highlight the message you want to send to a folder, and click the appropriate toolbar shortcut. It's that quick and that simple. You can find plenty of other useful Outlook add-ons out there. The picks below, for instance, will help you understand how recipients read your email, assist in zipping your attachments, and sync your Outlook contact and calendar information with Google and your Android device. Send an email to someone, and it's off in the ether. Who knows what happens to it, and whether the recipient ever reads it? Zendio knows. This Outlook add-on notifies you when the recipient of your email reads the message. That way, you know when it's time to follow up on that message; you can even determine when the best time is to send an email to that person, judging from their email habits. Zendio also tracks whether people click the links you send in email. It isn't cheap, though, at $10 per month. You can try it for 30 days for free. Outlook contact lists and Gmail contact lists have a communication problem, as do Outlook's calendar and Google Calendar: They simply don't talk. That means you may have to check two separate services for contacts, and you might need to keep two distinct calendars. CompanionLink ($50, free 14-day trial) reduces the hassle, however. It synchronizes contacts, calendars, to-dos, and more between Outlook and Gmail or Google Calendar. It's a tremendous timesaver. If you use Outlook and an Android phone or tablet, it's a must-have, because it can sync Outlook's contacts and calendar with Android's, using Gmail and Google Calendar as go-betweens. If you frequently send big attachments that you need to compress using the .zip format, check out the 45-day trial of WinZip Courier ($25). Install it, and it automatically zips attachments so that you don't need to go through the usual bother. It can also encrypt attachments, and it will even let you preview zipped attachments sent to you. Wouldn't it be nice if you had an assistant telling you whenever you received a new piece of email? With Mail Alert, you do. 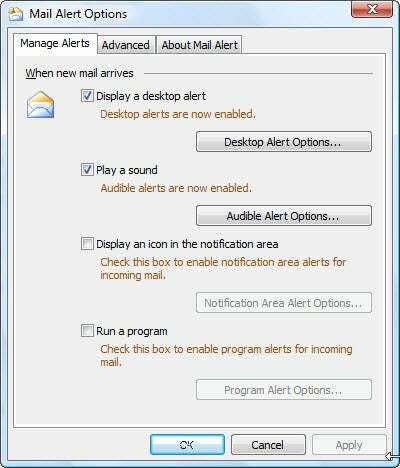 Whenever you get an email message, it pops up a desktop alert containing important information, including the sender, the subject, and the beginning of the message itself. You can even use it as a mini email client, performing some common tasks such as replying, forwarding, and more. It costs $7, and has a 30-day free trial. Have you ever found yourself on a Web page, wanting to send the URL to someone via email? If so, most likely you've found that it wasn't worth the bother of opening Outlook, copying and pasting the URL, and then sending the message. The free Firefox add-on Email This makes the process much simpler. Simply click an icon, and it launches Outlook (or another email client, or any of several Web-based mail services), creating a new email message and inserting the URL for you.